I think this is one of my favourite Christmas Cards this year .... so far! I like the simplicity and the pop of red that offsets the otherwise monochromatic colour scheme - and I really like the images in this Mistletoe Season stamp set. I first stamped the more solid of the misteltoe images with Mint Macaron ink onto Mint Macaron cardstock. Then I stamped the other image with Call Me Clover ink and coloured in the berries with White Craft ink. I stamped the bow with Poppy Parade ink and added a few little highlights with the white ink, since I had it there in front of me! 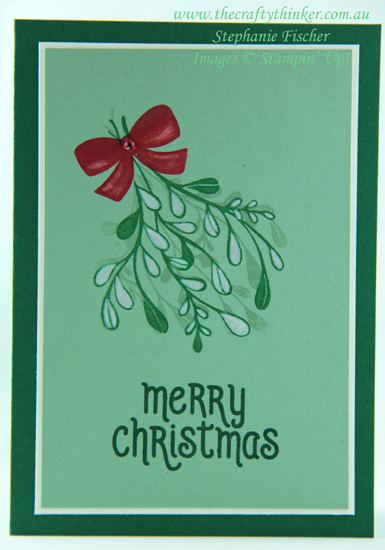 I stamped the greeting with Shaded Spruce ink and then (although it doesn't show in this photo) added some Wink of Stella shimmer to the bow and mistletoe. I layered my Shaded Spruce base card with some Whisper White followed by the decorated piece and then added one of the Red Rhinestones.